Following the launch of the Coupé and Sportback, Audi is completing the A5 family with the new A5/S5 Cabriolet for the first time in Detroit. Its design is based on the sleek lines of the Coupé. The rear window is now flatter and emphasizes the sporty looks, as do the short overhangs and the long wraparound hood with power dome. The classic soft top delivers outstanding aeroacoustics and now has a convenient opening function: just a quick pull of the switch is all it takes to open or close the soft top fully automatically, even while driving up to 50 km/h. Also included in the new A5/S5 Cabriolet are the latest technical connectivity features and driver assistance systems. The quattro drive provides the midsize Cabriolet superb traction and dynamic handling. Adaptive dampers are available as an option. They are incorporated into the standard Audi drive select dynamic handling system and allow the driver to choose between a sporty or comfortable driving experience. New engines for the Audi S5 offer powerful performance, with 190 hp in the 2.0 TDI and 2.0 TFSI, and 354 hp in the 3.0 TFSI. 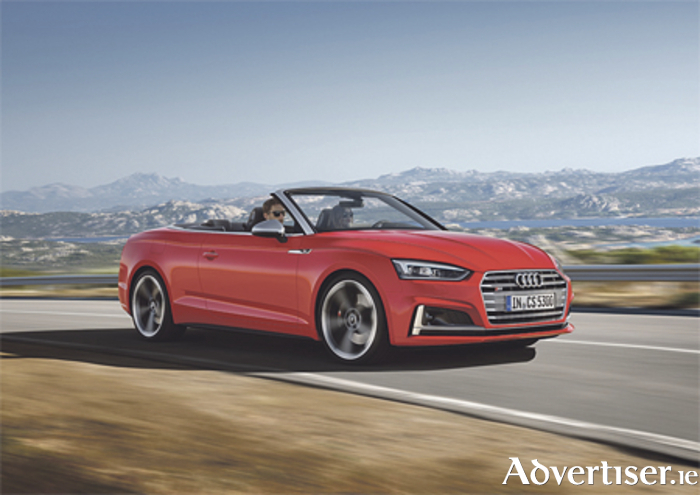 The new midsize Cabriolet will be available from March at Audi Athlone.